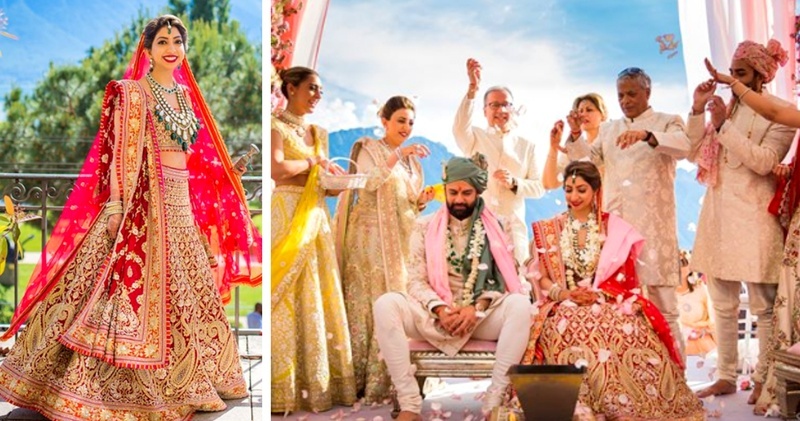 This Indian NRI couple who tied the knot in Switzerland is taking the social media by storm! It's not everyday that you see a wedding taking the entire social media by storm! Well very much a possibility when the wedding takes place in Montreux, Switzerland. The duo hosted their roka earlier this year at the lush venues in Atlantis. It was followed by an extravagant reception at Atlantis The Palm, Dubai. For the wedding and pre-wedding functions, the couple choose Switzerland for their destination wedding. With Snow-capped peaks behind you, palm trees in front, it comes as no surprise that Tanya chose to host her nuptials at Fairmont Le Montreux Palace. The wedding celebrations kicked off with a daytime mehendi function. Vibrant flowers were seen all around the venue, while the snow-capped mountains posed as the perfect backdrop to the setup. I am finding it really hard to take my eyes off Tanya’s yellow lehenga paired with an halter neck embellished bustier and a sheer dupatta draped like a saree. For the wedding, the outdoor space at the Fairmont Le Montreux Palace was decorated in shades of pink and white. While a large mandap decorated using pink drapes and fresh flowers stood overlooking the mountains, two large elephants created using pink blooms made for the key decor elements. Ah-mazing right? For taking the pheras, Tanya took the traditional route and donned a red Abu Jani Sandeep Khosla lehenga and looked phenomenal. She kept the makeup on point with soft smokey eyes, highlighter on fleek and a deep red on the lips. Her groom on the other hand looked dapper in off-white and green embroidered Sabyasachi outfit and paired it with a jade green saafa.